Ahoy there matey! You should think about becoming a sailor one day! The best decision that you could ever make as a parent is convincing your child to want to become a brave sailor. Sailors are very important people because they work on passenger ships, freighters, and tanker ships which can be very dangerous at times. Anything could happen when you're out on the open sea! It's a must that sailors be very intelligent since nautical navigation training is a necessity and learning that is not easy. Your boy will have to know how to calculate longitude and latitude at the drop of a hat so we hope that he learns to work well under pressure! Plus, your son has to be tough. He'll be required to swab and polish the floors of the deck until they are nice and shiny. Finally, he'll never be late to another important occasion ever again because he'll be so disciplined and he'll be use to having a strict regimen. 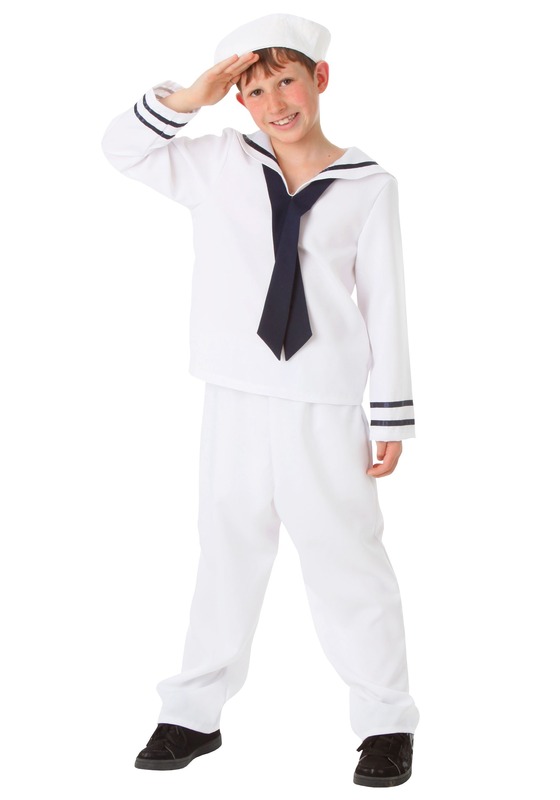 If you think the life of a sailor would be fitting for your child, then outfit him in this child white sailor costume. He'll look professional when he wears the shirt, pants, and hat. The shirt features a sewn on navy tie while the pants have an elastic waistband so they're stretchy and comfy. Outfit your son in this Halloween costume and hopefully he'll like it so much that he'll consider being a sailor as his future job. Hey, it's never to early to start planning for the future! Exactly as pictured. Fast delivery & great price! We got so many compliments! Costume was to small my son is 5 & I bought him a small which is 6-8 but he couldn’t get his head in the shirt & the pants were big. I had to keep the costume because I didn’t read the return policy so make sure to read it. Perfect outfit for my part as Pilot in the Little Mermaid Jr.